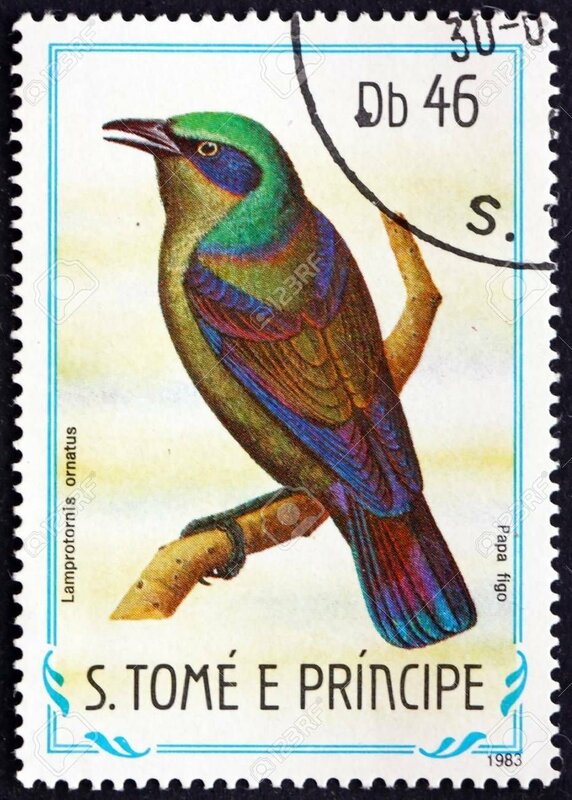 On foreground is the Papa Figo bird (Lamprotornis ornatus) - endemic of São Tomé and Príncipe. 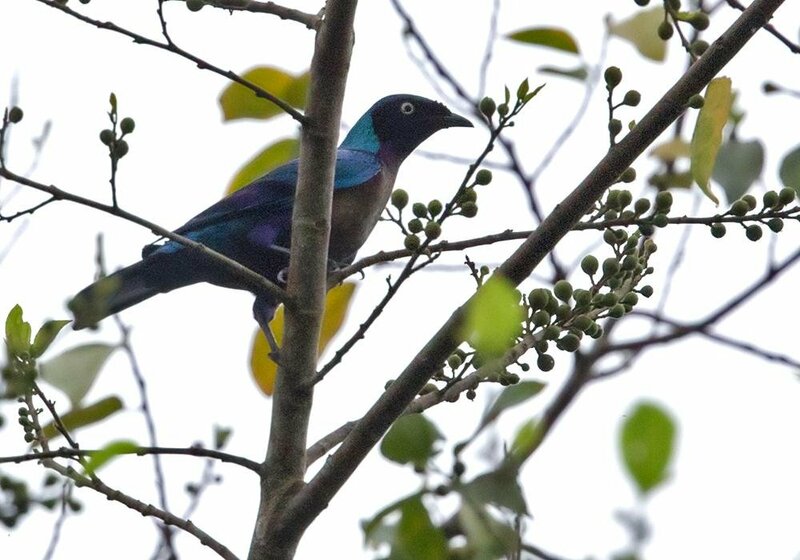 30 cm., 130 g. Large, iridescent starling with medium-length tail. 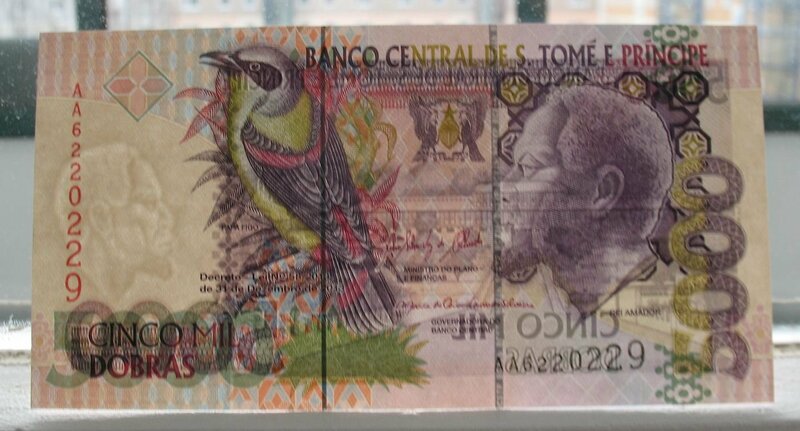 Behind the bird is the tree from Dacryodes family - the Papa Figo bird eat the fruits of that tree. Dacryodes is a genus of about 60 species of trees in the family Burseraceae. The generic name is from the Greek dakruon meaning "tear(drop)", referring to how resin droplets form on the bark surface. Dacryodes species grow as small to medium-sized trees. Their bark is smooth to scaly with pale sapwood. Flowers are unisexual. The fruits feature a fleshy and thick pericarp. 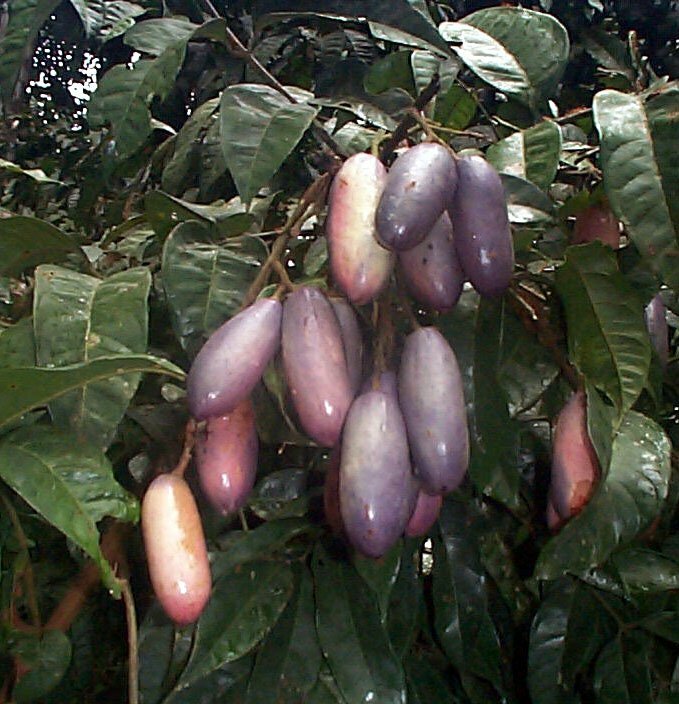 The fruit of D. rostrata is considered edible in Borneo. Dacryodes species grow naturally in tropical America, Africa and Asia. The habitats range from lowland to submontane forests from sea-level to 1,500 meters (5,000 ft.) altitude. 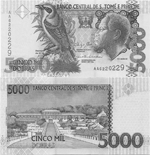 Agostinho Neto is a settlement in Lobata District on São Tomé Island, in São Tomé and Príncipe. Its population is 992 (2012 census). It lies 1.5 km. southeast of Guadalupe and 2.5 km. west of Conde. 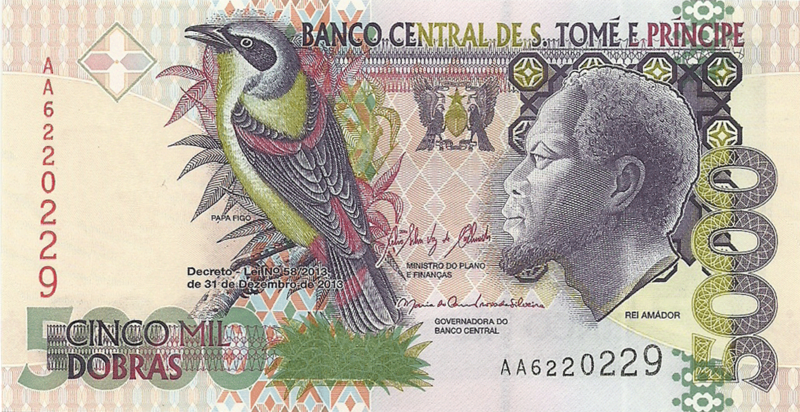 After São Tomé and Príncipe became independent in 1975, the settlement was named after the founding father of Angola, Agostinho Neto. The settlement grew around the plantation complex Roça Rio do Ouro, established in 1865. 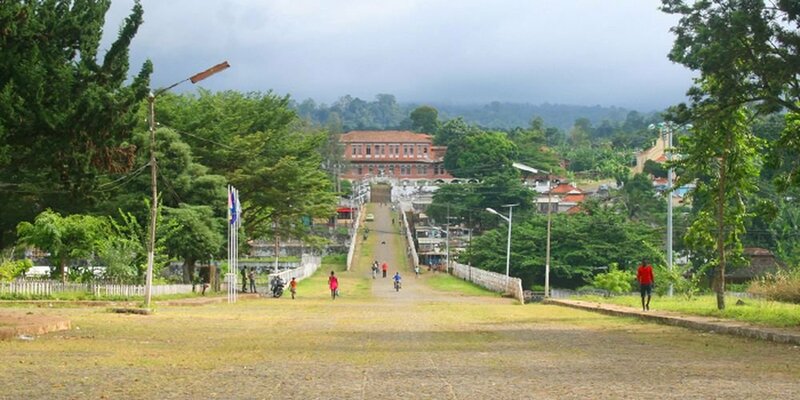 It is one of the most impressive agricultural structures in the country. There is a museum in the former mansion. The word "Roça" is to be pronounced « raw sa ». It is the equivalent of Fazenda (Brasil) and Hacienda (Spanish speaking countries). 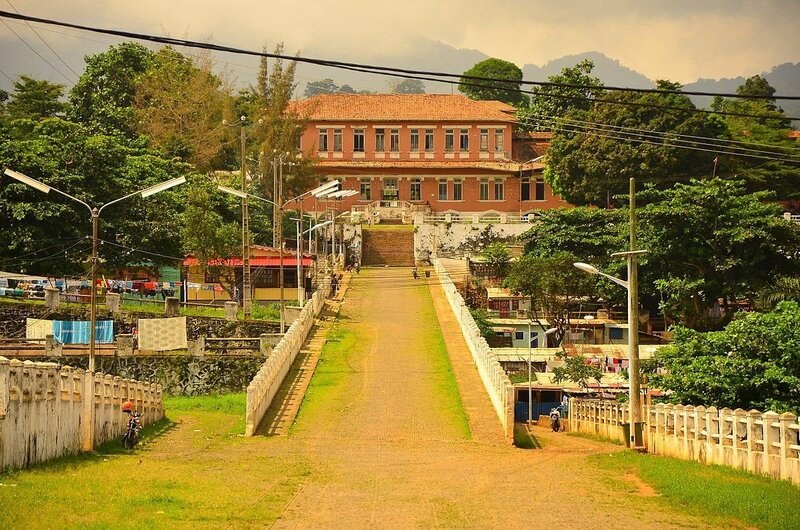 During the 19th and 20th centuries, when São Tomé was an important producer of cocoa and coffee beans, there were up to 150 roças in activity on the island. The roças were farms created by the Portuguese, usually with a centralized management, and dedicated to the culture of one kind of plantation (sugar cane in the XVI, and cocoa and coffee in since the XVIII century). The biggest roças could employ few thousand people and have there own churches, hospital, and train tracks. They were autonomous in food production, and provided housing for the workers. The first workers were slaves coming from Central African countries, and after the abolishment of slavery, then they became contracted workers. 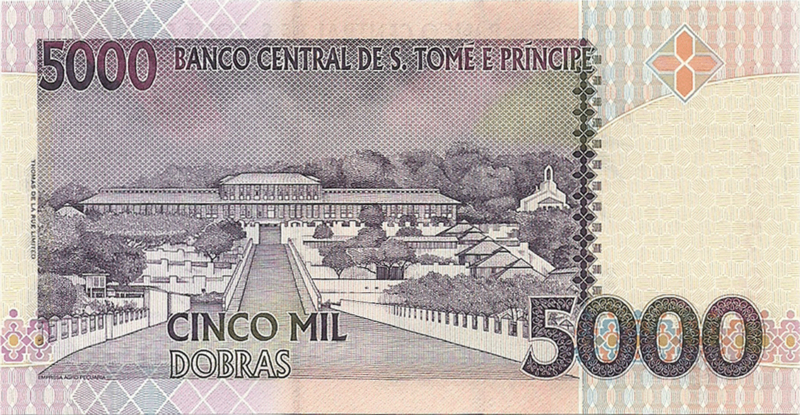 São Tomé, a former Portuguese colony, gained its independence in 1975, and most Portuguese left, abandoning the farms. Later, a generous « land distribution » plan was enacted by the local government, and small portions of land and housing were given to the people living there.